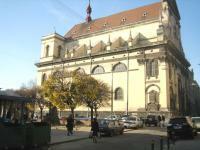 L'viv - the Ensemble of the Historic Centre represents a crossing point of cultures and architectural traditions. The trade routes in the Middle Ages attracted a number of etnic groups with different traditions: Ukrainian, Armenian, German, Jewish, Polish, Italian and Austrian. These groups lived in separate communities, and left their own religious and artistic marks on the city. In comparison to other central and eastern European towns of medieval origin, L'viv survived very well (comparable to Cracow, but with a different road in history). The Historic Centre of L’viv presents an eclectic mix of architectural and artistic highlights of both Eastern European and Western origin. I stayed there for 2 nights during the long Pentecost weekend. The city is very popular with Polish tourists – the border is only an hour away – and has a lively atmosphere with cafés, terraces and street performers. Cost levels are very low, they are comparable to those in Belarus which I visited last year and a fraction (25-30%) of those in Western Europe. It is easy to navigate in L’viv as signs around town are in English as well: a souvenir from the Euro 2012 football championships. L'viv has traditionally been a trading city, and has been part of the Kingdom of Poland (until 1772) and Austria-Hungary (until 1918). It attracted different populations that lived in their own communities - from Armenians to Jews, and from Ukrainians to Germans and Hungarians. Reminders of this multicultural history can still be found, though most of them have only been revived since post-Soviet times. Much of the buildings that one sees nowadays around town date back to ca. 1900, and subsequently there is a lot of Art Nouveau. The city has no exceptional highlights that would warrant a WH listing on their own and it lacks a certain prettiness that for example attracts the tourist masses to a town like Cesky Krumlov, but there is a bunch of sights that are worth seeing anyway. The Armenian Cathedral for example should not be missed. Its multicolour interior is vastly different from the usually sober Armenian churches that I have seen around the world. The facial expressions on the wall paintings (also dating from around 1900?) are odd to say the least. Further to the north lies the Opera, a neo-renaissance building from 1901 that could be at home in Paris. Nearby is the Andrey Sheptytsky National Museum. It still seems to adhere to the communist manual for museums (an elderly lady is present in every room), but the collection should not be overlooked. It mostly consists of late medieval and 16th-17th century icons that were removed from churches in the L'viv region. Even a few full iconostases are present. The quality of the icons is exquisite, and there are explanations in English. The main square (Rysnok Square) has a number of interesting 17th century merchants' houses. In one of them lies "the Italian courtyard" - the city's most romantic place, where photographers were busy capturing bridal couples when I visited. In the southeast of the center lies the former synagogue (only some ruins are left) and the Greek-Catholic Bernardine church with its fortifications. The L’viv WHS consists of two locations: besides the city center as described above, there’s also St. George Cathedral which lies some 2 km to the west. It is the main church of the Ukrainian Catholic Church. The yellow baroque and rococo style building lies on a hill. It was busy when I arrived: a wedding ceremony was going on. Apparently Sunday is a popular day to marry in Ukraine, because the next couple was already waiting outside. I was able to get inside anyway via a side entrance. Like the other churches that I visited in L'viv, there are many banners depicting saints and the Ukrainian national colours. St. George, killing the dragon, seems to be the most popular saint of the city. Looking back at the many small and larger churches that I visited in L’viv they are mostly Catholic in some kind of denomination (I did not enter a Orthodox church, although 32% of the population belongs to that faith). The proximity to Poland and the long shared history with the Polish people will be the cause of that. The popular Polish pope John Paul II is revered here very much as well. The Old Town in Lviv was named a Unesco World Heritage Site not without a reason. In the old city of Lviv different cultures reflect. Here the respective rulers - Poles, Austrians, Ukrainians - left their mark. The old town of Lviv is reminiscent of the old Austria or Krakow. However, it has not been renovated. Everywhere there are places where one can feel transported into a bygone century. The center of the old town is the Rynok. Here is the Ratusha. 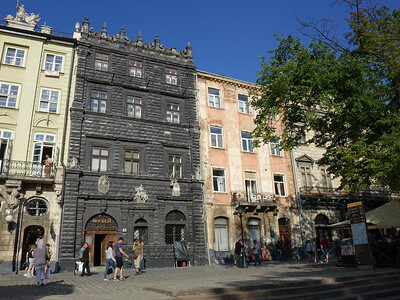 The old town hall houses today the county government of Lviv region. You can climb the great tower of the building for a small fee (about 40 euro cents). Then you have a wonderful panoramic view of the entire old town. In the old town there are eight churches. The oldest of these is the Armenian Mary's Cathedral in the Krakivska road. It was built around 1356. And such a variety of galleries and museums... The Ukrainian National Museum boasts a large collection of icons. As for the old synagogue in the Staroevreiska road, unfortunately the foundation walls are only preserved. Another highlight of the Old Town is the old Opera Lviv. Our first visit to Lviv was fall of 2010....a very old city with rich history....We stayed in the city center and were blown away by the beautiful old buildings, monuments, churches. Parks. Needed some upgrading to be sure, but such a surprising "find". Subsequent visit in 2011 showed construction everywhere-streets, airport , downtown- in preparation for the Eurocup in'12 . Still very enjoyable to stroll, rest in coffee shops, visit museums. On this, our 3rd visit to Lviv , summer, 2013, we are amazed by the positive changes in the city..the new airport is stunning, and the old buildings downtown have been refurbished. So much to see and enjoy in this old city.....I predict a flood of visitors when word gets out on the quality of hotels, food, transportation and the best part, the people who are giving such good service ! Things have changed !! If you want to relax, eat good food and take long walks in a beautiful town with brilliant architecture, Lviv is the place for you. Though still quite expensive to reach, it's financially rewarding once you get there. A three-course meal in the best restaurant in town did not cost me more than 14 euros and the average price was far below that. The Rynok Square is the centre point of the town and is in the old town and it is here you will find the true historic atmosphere. As a trading point between the east and the west, the rich town of Leopolis developed here already back in the 13th century. My personal prediction is that within 10 years from now, Lviv will be a serious destination on the tourist map of Europe. Just wait until Lviv has transformed from its current state of faded beauty and it will be a place well worth discovering for those looking for the absolute best pearls in Eastern Europe. Lviv (Lvov, Lemberg) is beautiful Central European city, but you shouldn't expect a grand majestic city like Prague, Budapest or Cracow. It is much more intimate in character. Its historic centre portrays medieval and Renaissance architecture, while its surroundings is mainly made of Neoclassical boulevards (prospects in Ukrainian) and churches (like the prominent St. George Cathedral). Some art nouveau architecture is present too (as for instance, the railway station) whereas Stalinist style buildings are surprisingly sparse. In the centre there are numerous churches, the most special of which are, in my opinion, the Boim Chapel and the Armenian church. The Boim Chapel is an amazing family church, built in the 17th Century entirely of black stone. It is artistically very impressive. The Armenian church is hidden in one of the smaller streets of the old town. Its entrance is hidden behind a barber shop. It has beautiful medieval frescoes and an atmospheric courtyard. Look for the impressive sculptures of Pinsel, a local German artist of the 18th Century. His works are found in several churches and there is even a museum entirely dedicated to his oeuvre. An important museum for art lovers is the National Museum where you can admire the history of Ukrainian art. Most significant is its collection of historical icons.